4.5 x 7 inches, 184 pages. Fine leather bound. 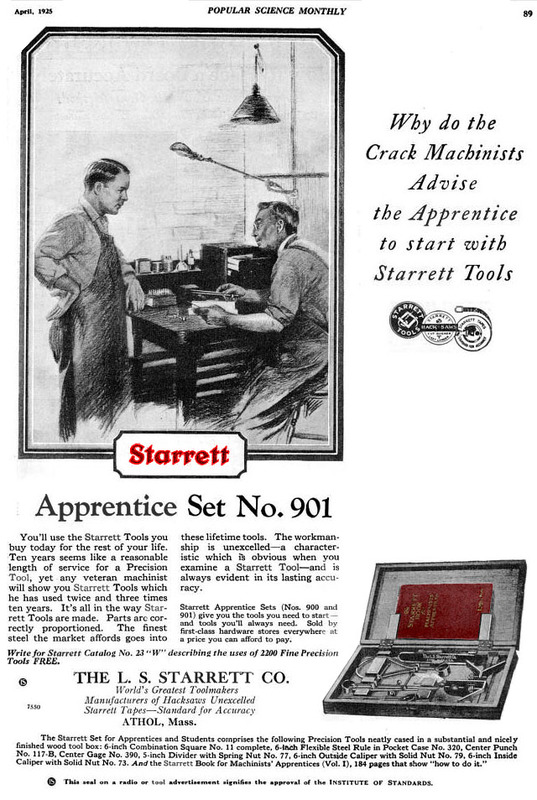 Starrett was always a supporter of student machinists providing reference books and special kits of good quality measuring tools for the apprentice machinist. Their kits included various numbers of basic precision measurement tools all covered in this book. 0-1 inch Micrometers, Combination Square, Dividers, 6" Vernier or Dial Caliper and Dial Test Indicator. Trade schools often offered Starrett kits at wholesale cost and used their books as text books. 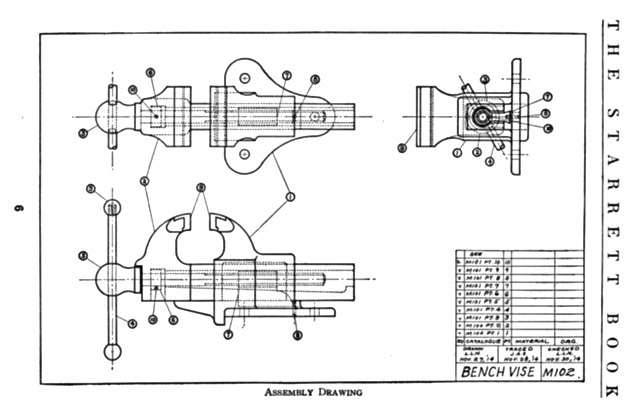 A common drawing featured in books on drafting and machinists manuals was a bench vise assembly and detail parts drawings. I suspect I drew this vise or one very much like it in my high school drafting class. Publication of this little manual coincided closely with MACHINERY'S HANDBOOK. Both riding the great industrial expansion of the 20th Century. 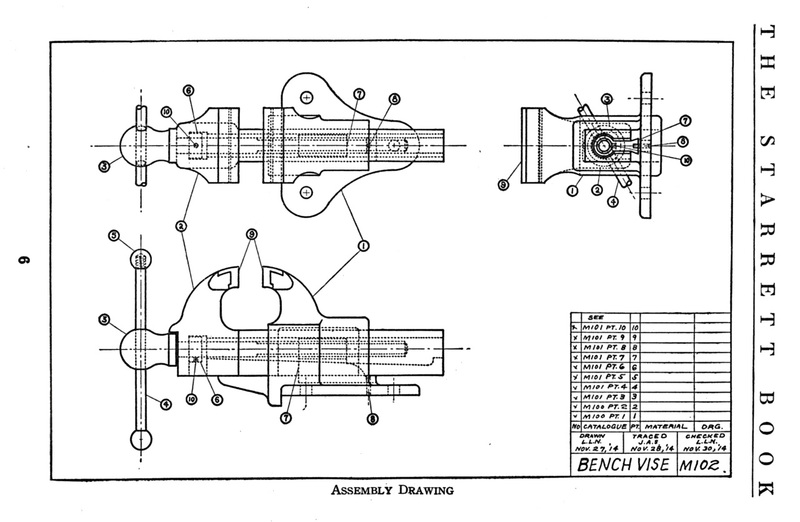 Page 54, Bench Vise Assembly Drawing. The assembly drawing shows the whole device, tool or machine and lists its specific parts. Parts can include custom made pieces or stock parts such as fasteners and their quantities. 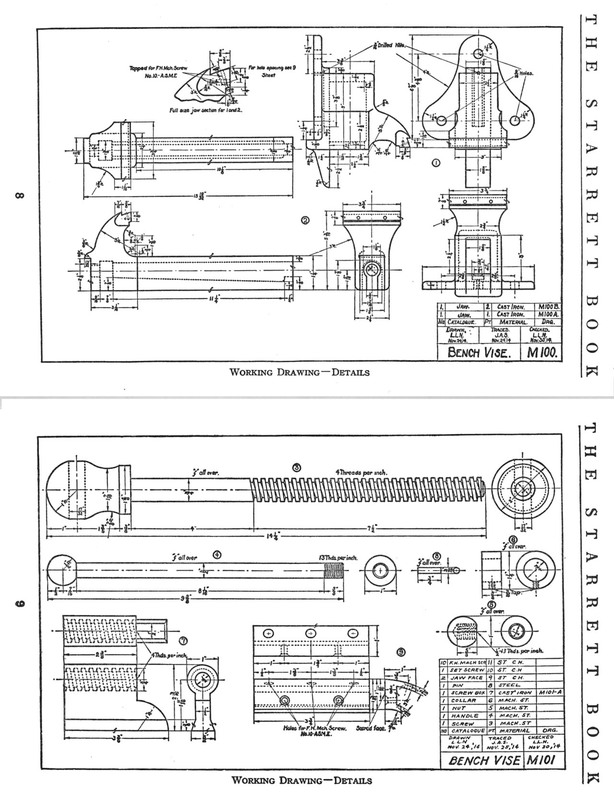 Assembly drawings can also include overall dimensions, weight and engineering notes. Page 55, Detail Drawings (2 sheets). Detail drawings can be individual part drawings, groups, or even detailed on the assembly. How detail drawings are organized is up to the company having the drawings made. However, in the digital age even the smallest simplest parts may have their own drawing. Detail drawings include material, finish, heat treating and part tolerances. All commercial engineering drawing title blocks generally include the company name, draughts man's name, date of creation, name and signature/initials of a checker or drawing approver, part number, revision dates and sometimes contract or PO number..
Every training manual of the era had a short section on working posture. The stance at the vise is similar to that of a boxer. 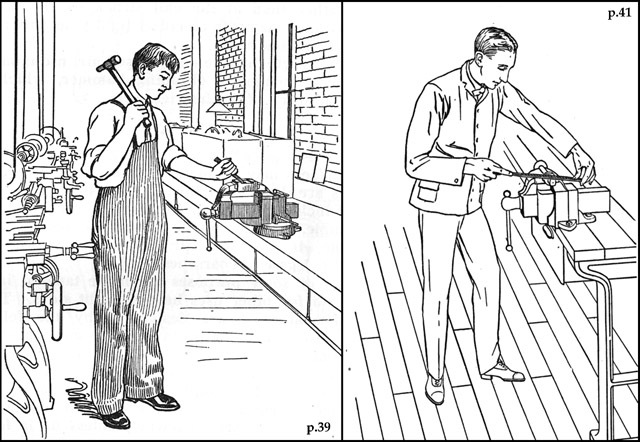 The Starrett book had these two illustrations showing chiseling and filing. Illustration from Metalworking Technology and Practice, 1943, 1947 Oswald Ludwig. 397 pages. 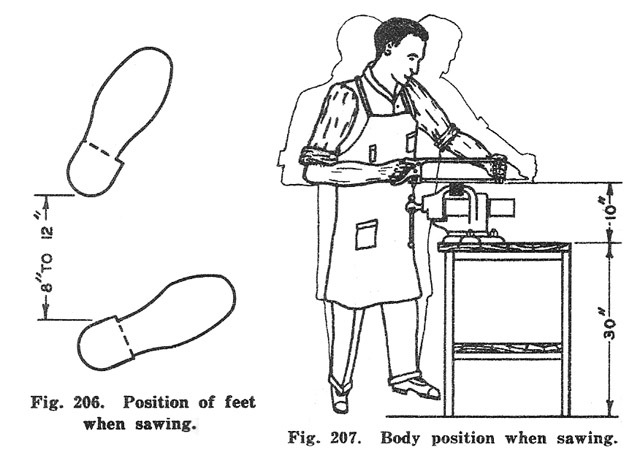 Years later this popular metalworking text book had quantified the posture with dimensions. In an attempt at being technical I think they went too far assuming an average that may have been overly ideal. 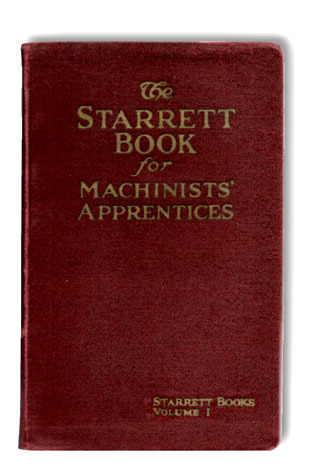 The Starrett Manual was the how-to instructions for their basic tools and apprentice kits.